The predictions and statistics for this week, the Commercial Bank Qatar Masters (European PGA Tour) and the Farmers Insurance Open (US PGA Tour) are now available on Golf Predictor. The European Tour stays in the Arabian Gulf this week, where the action as usual starts on Wednesday in Qatar. The weather is promised very windy, so that in combination with the relatively weak field, should make it a bit of a lottery. Meanwhile, there is a much better field in California, where five of the top ten in the world are teeing it up at Torrey Pines. Further to the recent addition of same region analysis (and here) to Golf Predictor, I am happy to announce that the Compare Predictions page has been updated with this new metric. 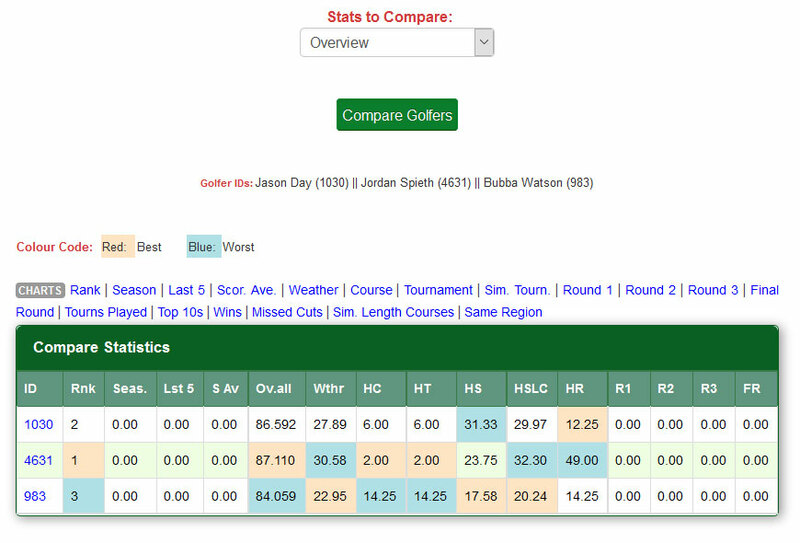 A new "HR" column has been added to the "Overview" stats table for your chosen golfers and a corresponding new "Same Region" chart link has been added above the table. This link shows a new pop-up chart with a graphical representation of the comparison. The "Overview" stats table on this page has also been updated with a new "Similar Length Courses" chart link. Clicking this link also shows a new pop-up chart and fixes an oversight when that functionality was introduced! These updates are shown in the screenshot above for the 2016 Hyundai Tournament of Champions (shown with Jason Day, Jordan Spieth and Bubba Watson selected). To make room for the new HR column, the world ranking column has been removed from the "Overview" stats table. The WR column is still available from the "Stats to Compare" dropdown box, via the renamed "DFS/PL(%)/Streaks/WR" option. As with the existing charts, the two new comparison charts are not available unless there are at least two golfers selected. These two new charts brings the total number of charts on the site to 459. As a result of these changes, you can now compare the main "Same Region" stat for your selected golfers and also see a visual representation of this and the "Similar Length Courses" stat. Just another way to make Golf Predictor even better. Hadyn Porteous (ranked 79th by Golf Predictor) won the Joburg Open on the European PGA Tour. The 21 year old South African secured his first tour win in only his 23rd start with a two shot victory over the field. Porteous held off his contemporary, Zander Lombard, with a solid final day performance to delight the home crowd. As an added bonus, Porteous (along with Lombard and Anthony Wall) qualified for The Open Championship at Royal Troon in July. In a disappointing week, our top ranked player, Jaco van Zyl, missed the cut and we had only four of the top thirteen plus ties (4/20) in this large field event with a relatively poor field. In the first full field event of the year on the US PGA Tour, Fabian Gomez (ranked 43rd by Golf Predictor) won the Sony Open in Hawaii. The 37 year old Argentinian came from four shots back with a closing 62 (-8) to win his second tour title. Gomez was helped by an impressive streak of seven straight birdies from the sixth hole on Sunday, which got him into a play-off with Brandt Snedeker. After the American missed a twelve foot birdie putt on the first extra hole, Gomez took his chance on the next to secure the title. Our top ranked player, Zach Johnson, finished in tied ninth and we had eleven of the top thirteen plus ties (11/27) in total.